If you would like a book to be included in The Home Book Club, please comment below with title, author, and why you’re interested in it. We’ll add it to our new page, The List, which details our upcoming books and targeted discussion dates for you to follow along. 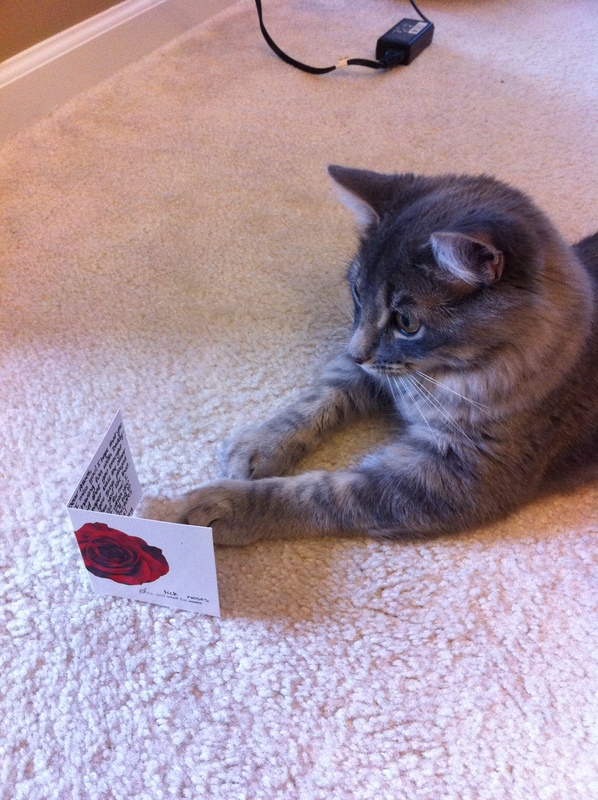 And because the internet doesn’t have enough cute cat pictures… here’s one more. This is my reading buddy, Albus! Get your favorite book on The List today! 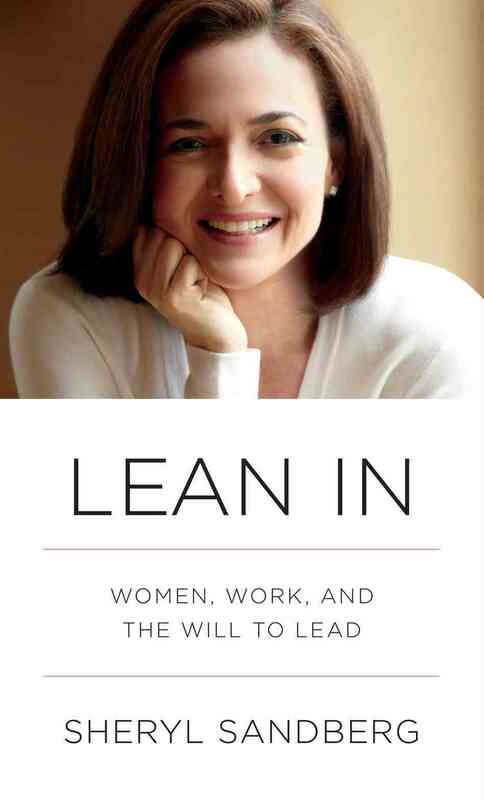 The next book to review will be Lean In by Facebook COO Sheryl Sandberg. In her book, released in March 2013, Sandberg discusses why women are underrepresented in the top echelons of business and company leadership (spoiler alert: it’s not all just because of “them”). Sandberg cites numerous examples and personal experiences to illustrate that women and men are perceived differently in the workplace and how that perception affects their own behavior. Check back on Friday, September 27th, for the full review. Full disclosure: I recently completed my Active Duty service as a Naval Officer and am “leaning out” of the workforce to pursue other personal and professional goals. While I have found a lot of sound wisdom in Lean In so far, I also know that my experiences and choices will influence my interpretation of this book. Please remember that each person reading does so from within their own circumstances. Opinions can be different, not wrong. I can’t wait to hear from others who have taken their own unique path in pursuit of their individual goals. – Have you made sacrifices for your career? What influenced you to make the choices that you did? – Have you seen men and women treated differently in your workplace? What was the reaction of the individuals involved? What was the reaction of other employees? – What is your definition of “success”? Describe a successful woman. Describe a successful man. Are the descriptions similar or different? – How do you take care of household chores in your home? Do work schedules and requirements dictate chore assignments? – What is your dream job? If you don’t have it yet, is it your goal? Why or why not? – List obstacles to achieving success. How many are self-imposed? In spite of a somewhat drizzly Saturday, the National Book Festival, held September 21st and 22nd on the National Mall, attracted crowds of adults, families, and even a few pets. The DC Metro was packed with people going to the festival—mothers with daughters, young couples on first dates, even out-of-town festival-goers that needed help navigating the lines. The day featured authors from all genres talking to readers about what motivates them, the future that they envision for their favorite characters, and even a few readings. My favorite discussion was given by Brad Meltzer, a literary jack-of-all-trades. He’s written fiction, non-fiction, comic books, children’s books, and even hosted History Channel’s Decoded. His latest book, The Fifth Assassin, was the focus of much of his discussion, but Brad didn’t stop there. He spoke about why he thought the National Book Festival was so popular among authors (hint- it involves the White House breakfast for participating authors and their chance to take home some “complimentary” napkins), his favorite DC area museum which started the train of thought that led to The Fifth Assassin, and his upcoming projects. He did it all with a satirical sense of humor that made his words resonate with the entire audience. His latest project is a series of Children’s books that tell the true stories of real heroes (think Amelia Earhart and Abraham Lincoln) as children. Check it out over on his blog. He concluded the discussion in the most admirable fashion, speaking humbly about his opportunity to travel around the world with the USO. Follow Brad Meltzer’s lead and donate your time or treasure to the USO. Check out the USO’s site for more information. After getting to hear from some beloved authors, we went over to the Pavilion of the States. Here, each state had a booth set up to show off the best of the book world from their region. 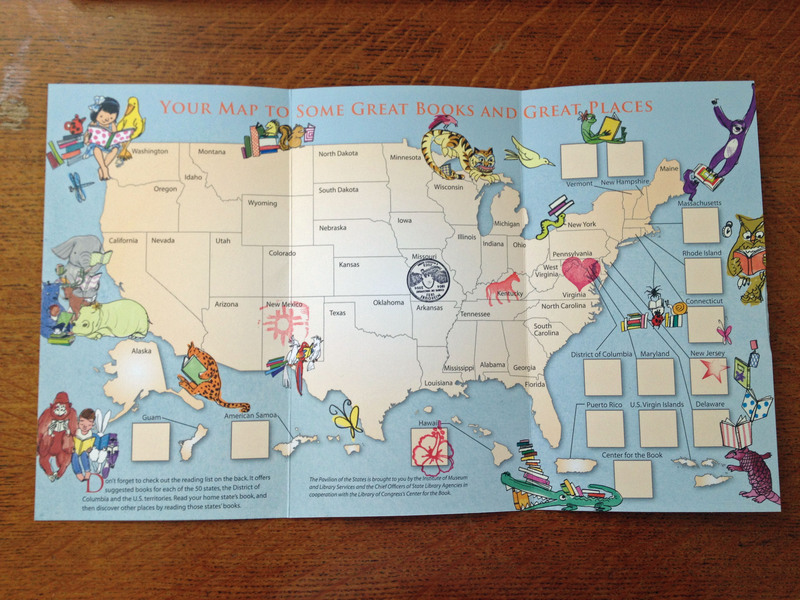 In honor of the book club, I visited Missouri, New Jersey, New Mexico, Virginia, and Hawaii. The gal at the Kentucky booth was so friendly, I couldn’t turn down a stamp from her. I’m not complaining; more book recommendations for me! What is a book? Magic! The best (and most challenging) part about the Pavilion of the States was how many people were there. How great to see so many readers get excited over book lists! Everyone I saw had a stack of pamphlets in their hand and a giant grin on their face. Before leaving, we walked by the Capitol Building and the Library of Congress. Washingtonians have a wonderful opportunity this weekend to “celebrate the book” at the 2013 National Book Festival, sponsored by the Library of Congress and chaired by President and Mrs. Obama. Click here for more information as well as a full schedule of events and authors. Not in the DC area? 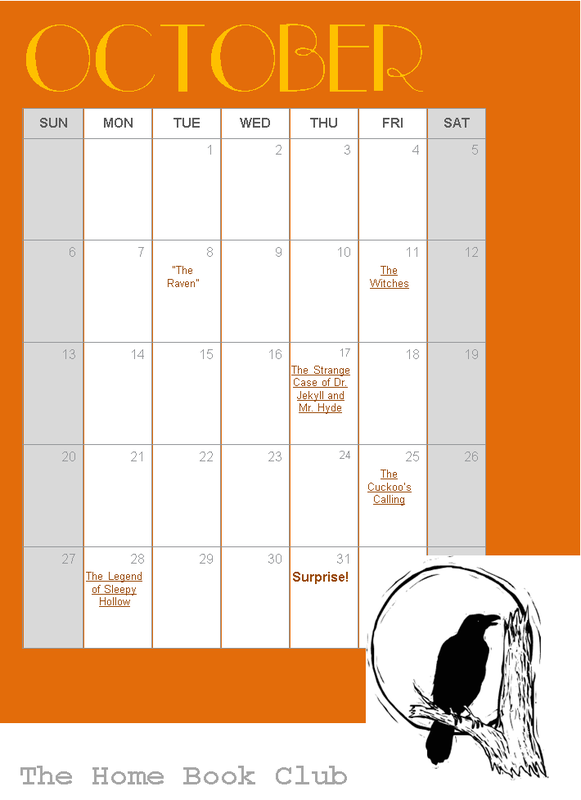 Click here for a list of literary festivals in your area! See you on the National Mall on Saturday! In his latest work, The Inferno, author Dan Brown reintroduces us to the scholarly yet resourceful figure of Robert Langdon. Only this time, Langdon, suffering from amnesia, is as unsure of his role in the developing drama as the reader, a plot twist Brown expertly uses to provide asides and explanations to the reader without stalling the plot. Langdon, after all, needs them, too. The focus of the novel is on an evil scheme designed to solve the world’s impending overpopulation problem. The schemer, a stereotypically misunderstood genius-scientist, leaves clues and references based on Dante’s The Divine Comedy (remember Inferno from high school English class? It’s the first and best known part of The Divine Comedy). While overpopulation is not specifically addressed in Dante’s work (probably wasn’t even discussed in Dante’s time—at least not on the scale that we think of it today), Brown’s antagonist obsesses over it and leaves clues to his master plot based on nebulous references to Dante. The novel is saturated with references to Dante, The Divine Comedy, and the outbreak of plague in Europe, known today as the Black Plague. I had high hopes for The Inferno as an exciting adventure novel, great to read during the last few days of a relaxing summer. While it certainly had its fair share of car chases and death-defying leaps from historically significant buildings, the constant tour guide-like quality of Langdon’s internal dialogue kept me from really escaping into the novel. However, if I was looking for a guidebook to Florence, Venice, or Istanbul, where the book takes place, I would be hard pressed to find one better than Brown provides in The Inferno. I don’t think that Trip Advisor includes accounts of the artwork seen in Florence’s Palazzo Vecchio while fleeing from ominously vague threats of death. I doubt that Fromer’s describes even the void above the ceiling in the Salone dei Cinquecento, Hall of the Five Hundred, as eloquently. So perhaps reading The Inferno as escapist travel literature rather than a novel allows its greatest attributes to be fully appreciated by the reader. 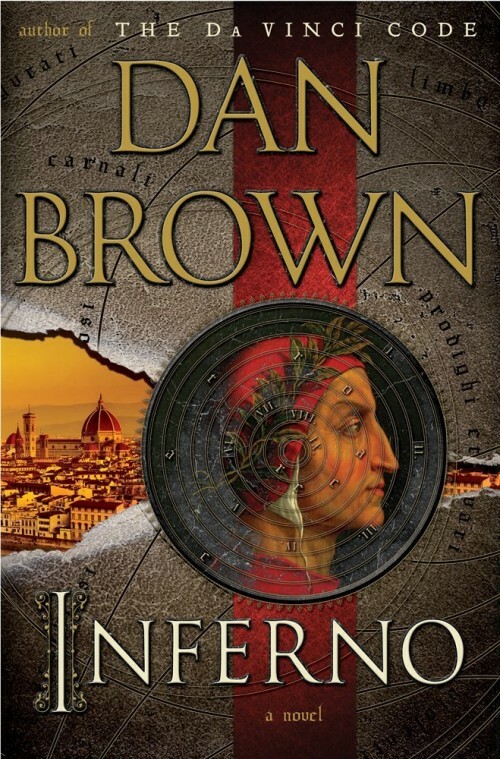 If I ever go to Florence, Venice, or Istanbul (as I hope to after reading such picturesque descriptions), I know that I will be packing my copy of Dan Brown’s The Inferno. What did you think of The Inferno? Have you ever been to Florence? Venice? Istanbul? How do Brown’s descriptions compare to the real-life experience of visiting these places? Any art historians out there? How did you find Langdon’s account of the works mentioned? Anything else that you think he should have noticed while fleeing for his life?